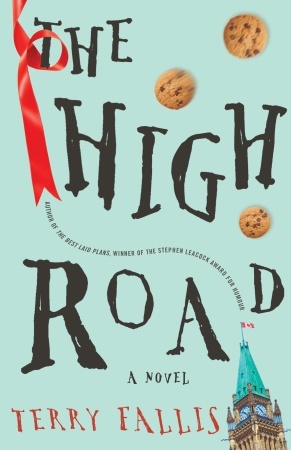 As I mentioned in my post on Friday, I purchased The High Road, the sequel to The Best Laid Plans, on my way home on Friday before I had even finished The Best Laid Plans. Yes, I loved The Best Laid Plans that much. In this book, Angus continued to insist on taking the high road, while wading through another election (which he actually wants to win this time); researching then writing the McLintock Report and dealing with its aftermath following the collapse of a bridge (Angus is an engineer after all); hosting the President and First Lady of the United States; and trying to influence the Throne Speech and Federal Budget. I don't think that I laughed out loud as much in this book as in the first, but it was still a very amusing read. And engaging. I did polish it off in 2 days; and even this afternoon, I was going to read for another 15 minutes then make dinner and when I checked my watch again, 45 minutes had passed. I continued to enjoy the narrative style which was the same as the first book - most of it is told in the first person through the eyes of Daniel Addison, Executive Assistant to Angus; with a brief journal entry by Angus at the end of each chapter giving his perspective on the story. Some of the jokes started to get a bit stale by the end (e.g. Angus and Daniel correcting split infinitives), but I was sorry to see the end of this book. The author's website announced last week that his next book is going to be published in September 2012. After spending the last week immersed in this fictional, yet eerily reminiscent of real life, world, I don't know how I am going to wait for a year and a half to read the next installment. The one thing that this book did was make me sad for the state of Canada today. I'm afraid that our government is going downhill; and I wish that we could have one Member of Parliament with the integrity and audacity of Angus McLintock that could change the direction for the better. I suspect that the budget that is going to be announced tomorrow afternoon will have nothing in common with the budget announced at the end of The High Road. Where is the Canadian politician today that will take the high road? Hi Kate, I stumbled upon your blog today and I'm glad I did! Like you I spend way too much money on books! You've mentioned a number of books I haven't yet come across - my "to read" list has grown even longer!